Interior Design Singapore: Is It Advisable To Install Ceiling Fan In Bedroom? Is It Advisable To Install Ceiling Fan In Bedroom? Giving value to that hard-earned cash is to spend it in items that you are going to benefit from especially comfort and convenience. One of the things a person can buy is the ceiling fans. They are great inventions that anyone can always incorporate into his or her place. This important home appliance has offered satisfaction to many property owners for over one hundred years. The fans have been circulating air in many homes giving comfort for their daily living. While a person may have a centralized cooling system within his space, ceiling fans are just captivating and should not be ignored. Those who were born during the days when air conditioners were the predominant cooling solutions into every indoor space should know the exciting and beneficial features of ceiling fans. Most of the ceiling fans have reverse switches and this makes them useful whole-year round. For example during hotter days, the fan can provide a cooler ambiance in the rooms by switching the blades to rotate in to a counter-clockwise motion. This can help a home owner to save four to eight per cent of the air-conditioning expenses. And during colder nights, the fans can circulate a warmer air when the blades are switched in clockwise movement and this can also help home owners to save up to two per cent on heating expenses. The saving feature of the ceiling fans help homeowners a lot when it comes to the budget. A person can provide comfort to his or her own house without spending a lot on the power bill. When it comes to bedroom decoration, there are several things to be considered. Every homeowner definitely expects the relaxing and comfortable atmosphere in the bedroom. Apart from sleeping, bedrooms can also be used as an escape after the tiredness and the exhaustion of daily routines. When it comes to furnishing your bedroom, bedroom ceiling fans is an excellent option for your bedroom. Bedroom ceiling fans are reasonably priced and easy to install, whether you are a DIY person or hire a professional to do it for you. If you want to enhance your bedroom, below are some things you should consider when it comes to ceiling fans. · Ceiling fans add a beautiful, decorative touch to the room. They are designed in a variety of sizes and shapes to fit any bedroom. A person can also choose from a wide variety of light fixtures and blade designs to blend with the theme of the bedroom or the entire house. Pull-chains are usually common, but many ceiling fans can be designed to flip on or off with a switch near the bed. Colour schemes of the fans are also varied. A person can get a painted veneer or wood finish, some with designs. The bedroom ceiling fan needs to run smoothly and quietly and not be a distraction. 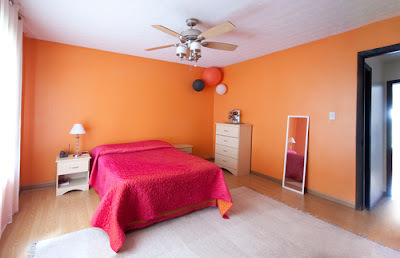 · Ceiling fans help in cooling the bedroom. Another advantage of having bedroom ceiling fans is they can help in controlling the room temperature. People normally use air conditioners but sometimes there are those who prefer fans to air conditioners. By having temperature control, you can feel the atmosphere as what you want so you can spend all bedroom activities comfortably and enjoyable. If your house doesn’t have a whole-house cooling or window air conditioner you will like the calm stir of indoor air that makes a room less stuffy. You can enhance this effect by opening a window to combine indoor with outdoor air. Opening 2 windows at the same time can create a cross breeze that your bedroom fan can help in propelling for a more extensive cooling effect. You can adjust ceiling fans that come with various speeds to create a high, medium or low circulating effect, depending on what you prefer for your bedroom. For example, children’s bedroom may not need as much ventilation as adults’ bedrooms. · Ceiling fans can help in muffling noise. Although most ceiling fans are not intrusive or loud, the soft background whirring from the swish of the blades can cover the sounds that come from other places in the home, such as TV sets in the living room, kitchen dishwashers or blenders, or even a pet's howling when locked in the crate for the night. Those people who work during the night and sleep during the day may particularly appreciate this, along with napping children or those who are light sleepers. Some people install 2 smaller ceiling fans for larger bedrooms rooms. This helps in keeping air flowing in all parts of the bedroom. A ceiling fan in the bedroom may help a person to enjoy more restful sleep. Research has shown that most people have better sleep when the temperature of the bedroom is less than 70 degrees. Just remember not to overdo it, particularly for someone who is sick or the elderly. Remember to adjust the movement of the fan to suit users of the particular room. Purchasing the incorporated ceiling fan and light is an added advantage because you will be able to get two benefits at once; therefore, it is a great asset for property value. When you choose the ceiling fans with lights attached, the ceiling fan itself can offer overall lighting and the lamps can provide the ambient lighting or accents lighting. It is also an excellent choice for small bedrooms to make them more efficient and the spaces can be utilised more effective. Many ceiling fans are designed in different styles from classic to contemporary to modern. Cleaning the ceiling fans is very easy. Just turn them off and wipe the light fixture and blades gently with a clean and soft cloth or a feather duster (using a stepladder). And to get value for your money, be careful when selecting the ceiling fans and check their durability, style and performance. Ceiling fans do not only make your house cool, but it also makes the home complete particularly when you pair it with the right bedroom lightning.